The skull of a New Kingdom period woman from ASN cemetery 94 currently in the KNH Centre. A small collection of ASN material was rediscovered in Manchester 25 years ago having been thought lost following the departure of Grafton Elliot Smith in 1919. Our previous work, which was sponsored by The Wellcome Trust and carried out in conjunction with The Natural History Museum, focused on completing a detailed review of the human remains that could be traced from the first ASN. It began a reinterpretation of the outcomes of the project in light of modern archaeological and palaeopathological research into ancient Nubia. Since the completion of the survey, the artefacts and related documentation have become widely dispersed, across several continents including Africa, Europe, North America and Australia. This dispersion now poses a significant threat to the collection; as time goes on damage to the artefacts becomes more likely, as does the risk of artefacts being separated from their provenance. 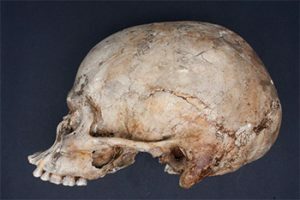 One of the major outcomes of the project was the production of an online database which brought the surviving human remains back together virtually. This is intended as a research resource for those studying the ancient Nubian population.